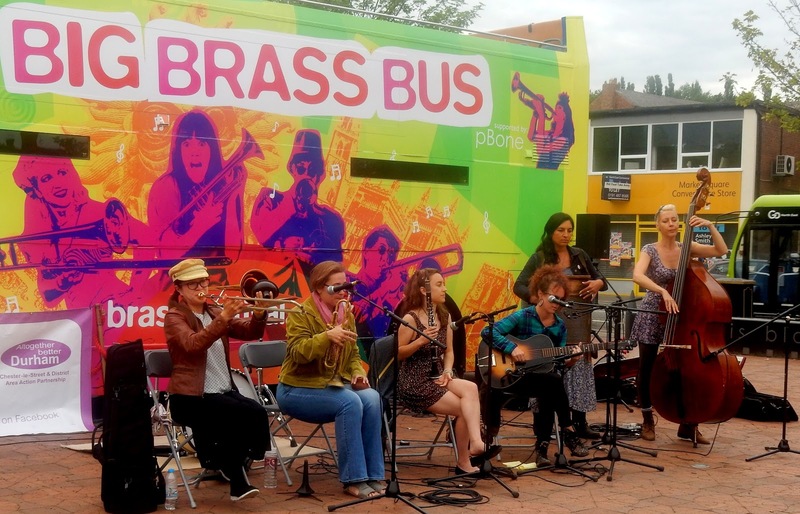 Marla Dixon (trumpet/vocal); Haruka Kikuchi (trombone); Chloe Feoranza (clarinet/vocal); Molly Reeves (guitar/vocal); Dizzy Incirlioglu (washboard); Julie Schexnayder (bass). 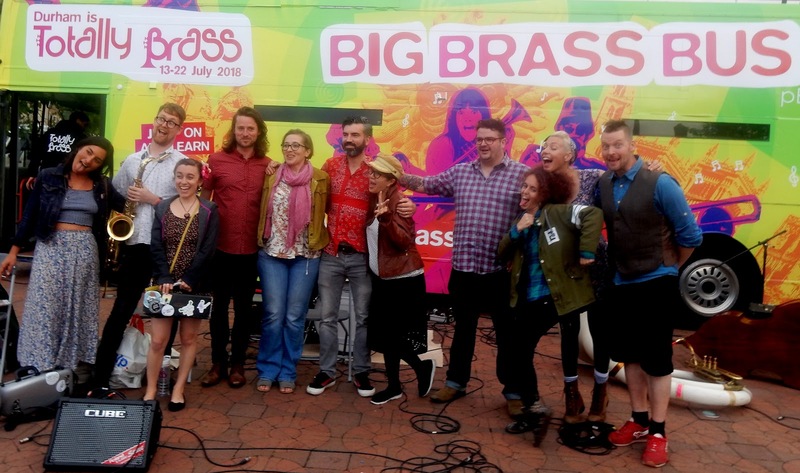 This year's Durham Brass Festival has been an eyeopener for me. In previous years, I concentrated on the big hitters - the names - blissfully ignoring what was happening on the street. I may have done the same this year if I hadn't arrived early for Friday night's Chrissy Lee/Gunhild Carling concert and heard the Shake 'Em Up Jazz Band playing a short set outside of the Gala Theatre. I couldn't quite believe what I was hearing. 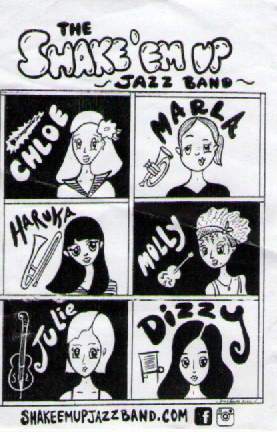 Six girls blowing like as though Jelly Roll Morton's Red Hot Peppers lived. Russell confirmed that the piquancy of the music came over with equal potency at Seaburn the following day and the two sets at Chester-le-Street last night sent me home, not on the number 21 Angel of the North bus, but on the Lucky 7 Cloud - destination Storyville. It was rousing Mardi Gras music all that was missing was the brolly parade although we did have a 'second line' of youngsters romping around the square. Milenberg Joys; When You Wore a Tulip; I Believe I Can Make it By Myself and Baby Face just some of the numbers that turned the Market Place into Congo Square. All six of these girls can hold their own in any company as instrumentalists and Marla, Chloe and Molly are no slouches in the vocal dept. either. It was all great fun without any drop in the artistic quality which is just the way it should be. In between sets, Scottish ceilidh band Reel Brass entertained with a potent cocktail of Poteen, Johnny Walker and Southern Comfort inspired traditional dance music Trumpet, trombone, tenor sax, guitar, sousaphone, bagpipes and accordion had the willow well and truly stripped. To round the evening off, both bands combined for a rousing version of Hindustan. Instruments were exchanged as were choruses between trumpets and trombones. Marla played sousaphone and hollered the vocal without mic. or megaphone and could be heard three streets away. I wanted the night to last forever but, all was not lost. I now have two CDs to recreate those moments when Chester-le-St. became Bourbon St.